Among the Mennonites of North Germany beer brewers and brandy distillers were relatively numerous. This may be due in part to the fact that not all professions and trades were open to them. In the region of Lübeck in the sixteenth and seventeenth centuries the Roosen family was even engaged in the manufacture of gunpowder. "Under his successors, Jan and Hildebrand ten Doornkaat Koolman, the company in 1905 consumed 5,803,400 lbs. of grain and paid a distillery tax of 684,049 marks." Concerning Mennonite distilleries in Leer, Fast gives the following information: "The distillery and yeast factory of the brothers Fritz and Gerhard Brouer was of general importance in that it developed large tracts of formerly unusable moorland. Such reclaiming of the heath was of especial value at a time when the government had not yet subsidized such undertakings and the work was of a pioneering nature. The founder of the business, the 82-year-old Consul F. Brouer, is still living (1946)." Concerning Friedrichstadt and Eiderstedt we read in Robert Dollinger's Geschichte der Mennoniten in Schleswig-Holstein (Hamburg and Lübeck, 1930): In Eiderstedt the merchant Andreas Linnich "furnished the prince with seventy three Reichstalers' worth of Hamburg beer during his visit to Toenning in 1659." In Friedrichstadt there were Mennonite brewers and distillers about 1700. "One of the respected brewery owners was Claus Jakob Tetens, who in 1715 in a period of nine months furnished 243 barrels (Tonnen) of beer to the garrison town of Tönning, which was more than one sixth of the total supply. Among his customers were the military, the mayor, and the two Lutheran pastors." In Friedrichstadt Spanish wine was provided for communion in 1668. In 1770 intoxication was made the ground for applying the "small ban." In Eiderstedt the prominent boat owner, merchant, and landowner Adam Teekes of Ameland in West Friesland, had to pay a fine in Westerhever in 1742 for desecrating the Sabbath by immoderate drinking (Zechen). Wikipedia. "Doornkaat." Web. 20 October 2013. http://de.wikipedia.org/wiki/Doornkaat. Wikipedia. "Jan ten Doornkaat Koolman." Web. 20 October 2013. http://de.wikipedia.org/wiki/Jan_ten_Doornkaat_Koolman. Crous, Ernst. 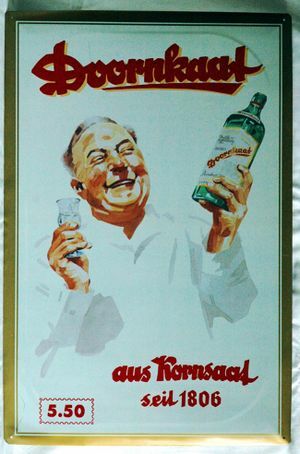 "Alcohol Among the Mennonites of Northwest Germany." Global Anabaptist Mennonite Encyclopedia Online. 1955. Web. 21 Apr 2019. http://gameo.org/index.php?title=Alcohol_Among_the_Mennonites_of_Northwest_Germany&oldid=120027. Crous, Ernst. (1955). Alcohol Among the Mennonites of Northwest Germany. Global Anabaptist Mennonite Encyclopedia Online. Retrieved 21 April 2019, from http://gameo.org/index.php?title=Alcohol_Among_the_Mennonites_of_Northwest_Germany&oldid=120027. Adapted by permission of Herald Press, Harrisonburg, Virginia, from Mennonite Encyclopedia, Vol. 1, pp. 41-42. All rights reserved.